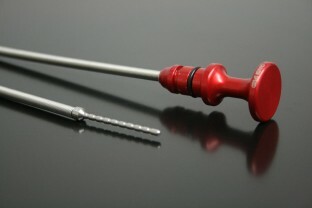 Cravenspeed MINI Dipstick for 2007+ R55 R56 R57 R58 R59 R60 MINI Cooper and Cooper S with N14 or N18 Engine. Like many customers say the dipstick is hard to read, this is the solution for you. The handle is machine lathe crafted from 6061 Aircraft aluminum and is powder coated red. The bottom sinker with the oil level meter on it is all stainless. We have cut 6 grooves into the sinker and they each catch a bit of oil. You can see from the photo that it is obvious which one has or has not been dipped into oil in the pan. Making is so much easier to read.